Many people who attend a Catholic funeral for the first time will often remark how beautiful it is. Steeped in centuries-old custom and ritual as Catholic funeral rites are, that’s understandable. But the most important aspect about Catholic funerals is that they express the Christian hope in eternal life and the resurrection of the body on the last day. Every component of the Catholic funeral rites should express these fundamental beliefs and hopes. Our funeral rites are not “a celebration of life,” as they are referred to sometimes, but a privileged opportunity to return to God the gift of the deceased, hoping to usher them into paradise with the aid of our prayers. Our love for the departed is expressed after death, above all else, in our prayer for them. When a loved one dies, those left here to ensure their proper and dignified burial can often get bogged down by all the decisions needing to be made. In that case, we often will miss the opportunity to focus on the faith and hope the Catholic funeral rites express. Bereaved family and friends often will have to make many decisions about their loved one’s funeral, but often may not be fully prepared to do so. 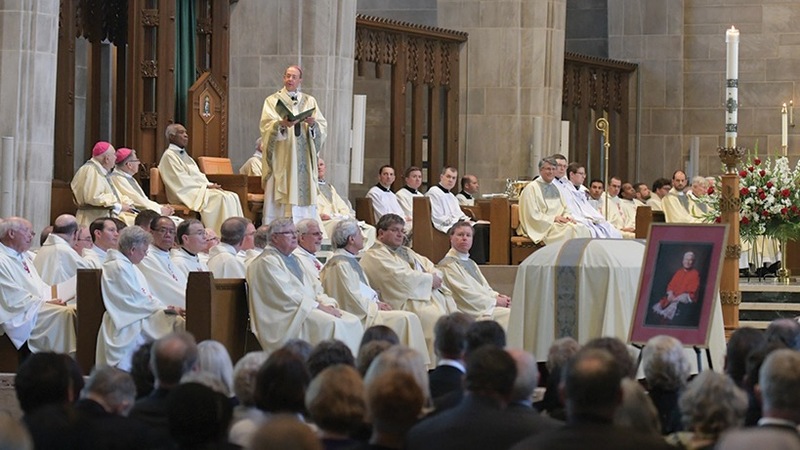 Whenever possible, the Church recommends that the family should be involved in planning the funeral rites — from choices of texts and readings to music and liturgical ministers. They may wish to make decisions on some of these components and not on others. They may leave some or all of the decisions up to the parish staff as well. 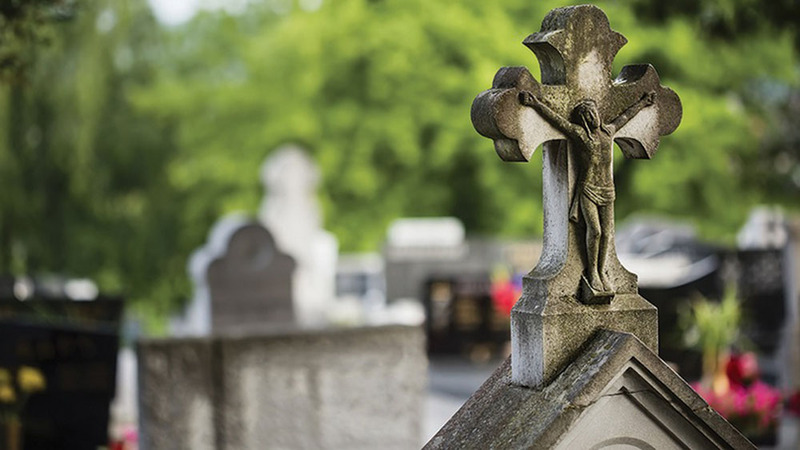 This guide is meant to explain the Catholic funeral rites and give some guidance on the decisions that will need to be made — in light of Church teachings — at the time of a loved one’s death. It might also be helpful in preparing some notes on our own funeral. While death might seem like the end of the road, Christians believe it is just a beginning. “In the face of death, the Church confidently proclaims that God has created each person for eternal life and that Jesus, the Son of God, by his death and resurrection, had broken the chains of sin and death that bound humanity” (Order of Christian Funerals (OCF), No. 1). This maxim guides the Christian approach to funerals. There needs to be direct communication with the parish and funeral home. 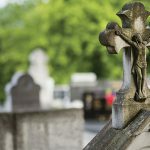 Usually, funeral homes are fully aware of each parish’s expectations and regulations. But it is important to be in communication with the parish directly. Perhaps someone can be appointed within the family to be the point person for this communication, depending on the circumstances. One of the first decisions that needs to be made is whether the deceased will be buried or cremated. Cremation is allowed, so long as this option isn’t chosen to express anything contrary to Christian hope — particularly the hope in the resurrection of the body. Nonetheless, the Church’s tradition recommends burial over cremation. More and more families are opting for cremation today to decrease funeral expenses. But the decision should be based in all the facts, so make sure to compare the costs when discussing options with the funeral director. In either case, a place of burial needs to be chosen. The Church’s preference is that Catholics be buried in the consecrated ground of a Catholic cemetery, but other cemeteries may be chosen. The point is that bodies need to be disposed of in a fitting and dignified way, consonant with the human dignity that should be afforded to everyone, made in the image of God as we are. Cremains must also be buried — they are not to be placed in the home, spread on land or at sea, etc. This need not be only in a cemetery grave. One popular method to afford cremains their proper respect is to use a columbarium — or niches, akin to mausoleums — which cemeteries and parishes in more frequency are constructing to contain cremains. It is also preferable that Catholic graves be marked in some way. Although, burial at sea is also permitted — so long as the body or cremains are in a sealed container (not spread openly) — and a marker might not be possible in these circumstances. The choice of burial or cremation also will indicate how much of the remainder of the funeral events take place. If burial of the body is chosen, the funeral is often held within a few days. If cremation is chosen, that time could be extended a bit — although it is preferable to celebrate the funeral as soon as possible and not delay it for too long. Also if cremation is chosen, will there still be a viewing of the body and will the body be brought to church for the funeral Mass, or will the body be cremated shortly after death? When burial of the body is chosen, several factors need to be considered. It’s most common to choose respectful and appropriate attire, mindful of the respect to be shown toward the body. Consideration should be given to display some Christian symbols in or near the casket at the time of a wake or to be buried with the deceased — such as a crucifix, rosary or Bible. The Church advises that, where possible, friends and family should be included in taking part in the preparation of the body. The decision that needs to be made at this stage is whether the funeral will take place in the context of Mass or not. It is preferable to celebrate the funeral Mass in the presence of the deceased’s body. “The Mass, the memorial of Christ’s death and resurrection, is the principal celebration of the Christian funeral” (OCF, No. 5). Catholic funerals express the Christian’s union in Christ’s death and our hope to share in his resurrection. It’s most fitting that the life of grace inaugurated for the deceased’s soul that began in a church at baptism is returned to God in thanksgiving at the Mass. There are times that a funeral Mass might not be chosen. Perhaps our loved one had been separated from the Church for a long time and a funeral Mass wouldn’t seem the most appropriate. Or maybe the burial needs to take place on a day when no priest is available or on a day when the Church prohibits the celebration of a funeral Mass (Holy Thursday, Triduum, solemnities of obligation, Sundays during the seasons of Advent, Lent and Easter). 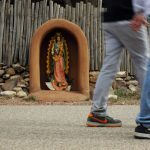 There could be other pastoral reasons for this as well, which should be considered when meeting with parish staff during the planning stages. These would include the life of the deceased and the circumstances of death. To express our love for the deceased it is recommended that, if a funeral Mass is not chosen, a memorial Mass should be scheduled for the deceased’s intention at a later date. 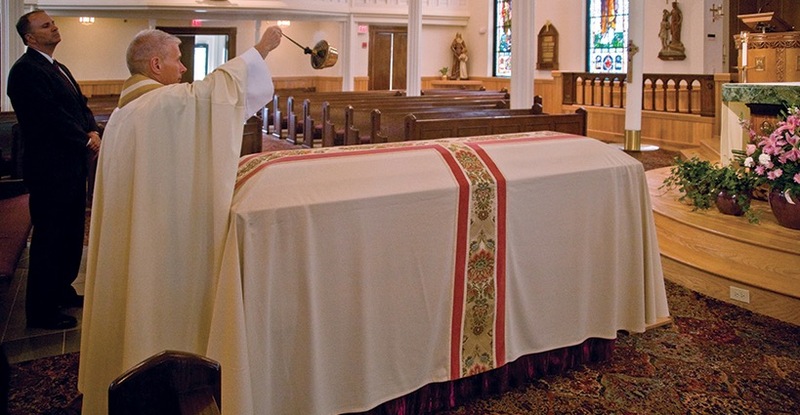 A funeral outside of Mass may be officiated by a deacon, priest or bishop — or in some cases, even a lay minister, depending on circumstances. 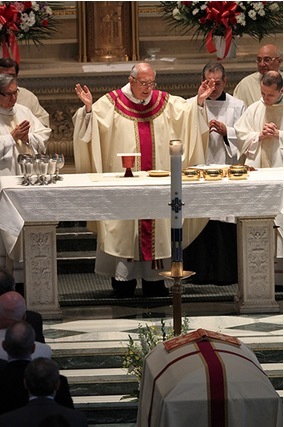 If Mass is not chosen, a funeral Liturgy of the Word and final commendation of the deceased is celebrated. This doesn’t need to be celebrated in the church itself, and the church is perhaps not the most appropriate setting at times. A funeral outside of Mass may be conducted at the funeral home, in a chapel at the cemetery or even at the graveside. The death of a friend or family member is, in fact, a social event, often affecting far more people in a community than the deceased’s immediate relatives. Wakes, or viewings, are an opportunity for family and friends to come together, console each other and recall the impact the deceased had on them. This usually occurs, in American culture, at the funeral home. 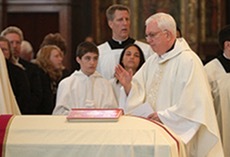 The Order of Christian Funerals also provides for the possibility for the vigil to be conducted in the church itself. This, however, would need to be negotiated with parish staff. Wakes find their origins in the Christian celebration of vigils, often associated with major events or feasts. The vigil for the dead is intended to be dedicated to prayer for the deceased. The Church supplies a liturgical rite for wakes, to be celebrated by a sacred minister of the Church, or it may be celebrated by a lay minister in some cases. This is a combination of readings, a brief homily or reflection, prayers and possibly music. The wake is also a time to celebrate any popular devotions that might have been particularly significant in the faith life of the deceased — such as the Rosary or the Divine Mercy Chaplet. Another option for the wake is to celebrate the Office of the Dead. This comes from the Liturgy of the Hours — the Church’s daily prayer, composed of psalms, readings and prayers. This will likely require more preparation and other ministers to celebrate it appropriately, so it is good to discuss any deviations from normative practice with a member of the parish staff. Sometimes there are additional viewing hours before the funeral itself, or it is one last opportunity for close friends and family to be with their loved one’s remains before the funeral. It is customary to distribute some kind of small remembrance cards during wakes or funerals. It is a good idea to remember that the deceased is best served by our prayers, so a prayer, Scripture passage or holy image would be helpful to incorporate into any such mementos. Since the Catholic funeral rites do not usually envisage the opportunity for eulogies at the funeral Mass, the vigil is often a fitting time for those wishing to speak a word in memory or in honor of the deceased. Particular parishes and dioceses will likely have guidelines about this, so it is a good idea to ask when communicating with parish staff if anyone hopes to share some words of remembrance. First and foremost, we show our love for the dead through our prayer. A centuries-old custom is to celebrate a Mass for the deceased on the one-month anniversary of his or her death, called a Month’s Mind Mass. Into the future, it is also customary to arrange for Mass intentions for the deceased, perhaps on their birthday, anniversary or death date. We can also obtain indulgences for them, such as the indulgence available for visiting a cemetery during November, a month the Church traditionally sets aside to pray for the dead. 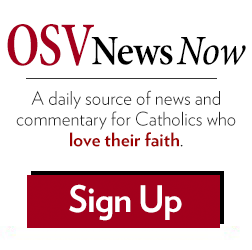 Michael R. Heinlein is editor of OSV’s The Catholic Answer magazine. Follow him on Twitter @HeinleinMichael. Holy water: A reminder of the deceased’s membership in the Body of Christ through baptism. Holy water is used to welcome the body or cremains into the church and at the time of the final commendation. Easter candle: The Easter, or paschal, candle reminds Christians of Christ’s presence among us. Blessed each year at the Easter Vigil, the presence of the candle at the funeral also reminds the assembly of that night when, in hope, the Church anticipates Christ’s resurrection. Pall: It is customary in the United States and other places to place a white cloth over the casket or cremains, called a pall. This is another reminder of baptism — when each of the baptized receives a white garment that signifies their dignity. The pall also symbolizes that each person is equal in the eyes of an all-loving and merciful Father. Book of Gospels or Bible: Christians model their lives on the Word of God and so it might be appropriate to place a Bible or Book of the Gospels atop the casket or near the cremains during the funeral Mass. It reminds the assembly of the deceased’s fidelity to the Word in this life that leads them to newness of life in eternity. Cross: A cross or crucifix may be placed atop the casket or near the cremains during the funeral Mass. This reminds us of the primary Christian symbol with which we were signed at baptism and by which Christ redeemed the world and won victory over sin and death. Incense: Incense serves a twofold purpose in the funeral rites. It is used as a symbol of our respect for the deceased’s body, which became a temple of the Holy Spirit in baptism. And it also represents the prayers of the assembly on their behalf, rising to God’s throne. Flowers: Flowers may be used “in moderation” (OCF, No. 38). Some parishes have specific rules on the use of flowers, so it is a good idea to check with the parish staff before making arrangements. Liturgical color: For funeral Masses in the United States, the sacred ministers may wear white, violet or black vestments. “The liturgical color chosen for funerals should express Christian hope but should not be offensive to human grief or sorrow” (OCF, No. 39). This is the choice of the sacred minister, but if you have a preference, feel free to express it. For most Catholic funerals, the Mass of Christian Burial is chosen. The normal place for its celebration is the parish church of the deceased. As with the planning of any Mass, many decisions must be made about options for aspects like music and readings or persons taking a part in one way or another. Several of these components would also be considered for a funeral outside of Mass. These decisions are usually made in consultation with parish staff. The readings from Scripture “provide the family and the community with an opportunity to hear God speak to them in their needs, sorrows, fears and hopes” (Order of Christian Funerals, No. 22). There are four readings for a Catholic funeral. Parish staff usually supply family with copies of the readings from which they can make their decision.The first reading is typically one of seven options provided from the Old Testament. The exception to this is when the funeral takes place during the Easter season, in which case a first reading is chosen from one of five options found in either Acts of the Apostles or Revelation.The responsorial psalm may be recited, but is most typically sung. There are 17 options for the psalms that may be chosen. Typically there are several different musical settings for each, so that can be discussed with the parish staff.The second reading most typically comes from one of St. Paul’s letters, although there are two of the 17 New Testament options that come from the first letter of St. John. 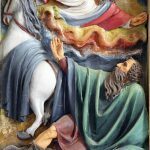 There are 24 options to choose from for Gospel readings, most of which are from the Gospel of St. John.In addition to all of the options of readings above, which are aimed at funerals for adults, there are two other sets of readings for funerals of children, either before or after baptism. The orations of the presiding minister address God on behalf of the entire Church in their prayer for the deceased. In addition to general orations (either inside or outside the Easter season), there are a variety of options that may be suited to more specific circumstances — such as for a young person, for one who suffered a long illness, or one who died suddenly, etc. There are five options for the preface of the Eucharistic prayer. And Eucharistic prayers 1-4 have special inserts for a Mass on the day of burial. The special insert for Eucharistic Prayer 3 is particularly poignant. 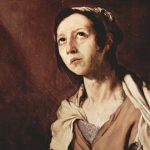 The music chosen for a Christian funeral “should express the paschal mystery of the Lord’s suffering, death and triumph over death and should be related to the readings from Scripture” (OCF, No. 30). As a resource to those planning funerals, many parishes will often have a list of hymns appropriate for use at a funeral from which to select. “The music at funerals should support, console and uplift the participants” (OCF, No. 31).While it might differ based on parish custom, there are normally three hymns chosen for use at the entrance, preparation of the gifts and at the reception of Communion. There is also what’s called the song of farewell, sung at the end of the funeral Mass during the final commendation. This is also something to discuss with the parish staff if you are interested in options.Both the General Instruction of the Roman Missal and the Order of Christian Funerals suggest the importance to incorporate an element of silence at the Mass, and this is no different for funerals. Moments of silence “permit the assembly to reflect upon the word of God and the meaning of the celebration” (OCF, No. 4). It is natural to want to include at the funeral various family and friends of the deceased. Because many of these roles are liturgical, great care must be taken to ensure that these ministers all well-trained and suitable. You may wish to choose readers for the first and second readings, to present the gifts at the offertory or to serve the Mass. Perhaps those with musical talents might be able to utilize them in consultation with the parish staff. In addition to liturgical ministers, there might be the need for pall bearers (usually six) or representatives of the family or close friends to place the pall and Christian symbols on the casket or near the cremains. ◗ There needs to be direct communication with the parish and funeral home. Perhaps someone can be appointed within the family to be the point person. ◗ The Church’s preference is that Catholics be buried in the consecrated ground of a Catholic cemetery, but other cemeteries may be chosen. ◗ Cremation is allowed, so long as it isn’t chosen to deny hope in the resurrection of the body. The Church’s tradition recommends burial over cremation, and cremains must also be interred in the ground or a columbarium — not placed in the home or scattered. ◗ If burial of the body is chosen, the funeral is often held within a few days. ◗ If Mass is not chosen, a funeral Liturgy of the Word and final commendation of the deceased is celebrated and can be done in the church, a funeral home, in a chapel at the cemetery or even at the graveside. ◗ The vigil for the dead is intended to be dedicated to prayer for the deceased. ◗ It is customary to distribute some kind of remembrance card with a prayer, Scripture passage or holy image. ◗ A vigil is often a fitting time for those wishing to speak a word in memory or in honor of the deceased. Diocesan and parish guidelines should be consulted. ◗ The Mass of Christian Burial offers a selection of readings, prayers, music and liturgical roles to be chosen and often performed by family members. ◗ A centuries-old custom is to celebrate a Mass for the deceased on the one-month anniversary of their death, called a Month’s Mind Mass. ◗ It is customary to arrange for Mass intentions for the deceased, perhaps on their birthday, anniversary or death date.